Thinking of buying a trampoline? First, make sure you read this free guide to the different types of trampolines available for use and sale in the UK. Many people are under the impression that trampolines are only produced in limited styles and sizes. This is wrong. Although mainly used in back gardens and gymnastic competitions, there are many different shapes and sizes of trampolines available on the market ranging from 5ft to 15 ft trampolines! Rectangle or Circular Back Garden Trampolines? There are mainly two generic types of trampoline on today’s market, competitive and recreational: So which trampoline would suit you best? 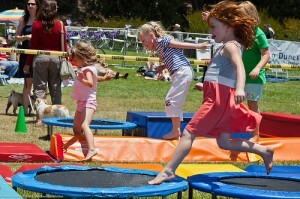 Trampolines are used competitively in gyms and the Olympics and are designed with maximum impact and safety in mind. Competitive trampolines tend to be large in comparison to recreational trampolines and give gymnasts increased power and propulsion in the air, to perform somersaults and other twists and rolls they perform. To accommodate for the increased performance of competitive trampolines, they are also kitted out with thicker safety-padding around the nets and added landing mats, to protect gymnasts from hurting themselves when performing at incredible heights. Gymnasts are not the only sportspeople to use trampolines: divers, acrobats and skiers commonly use competitive trampolines to practice turns and twists they use when diving, performing or gliding down the slopes. Recreational Trampolines are great fun for all of the family and make an energetic addition to your back garden. 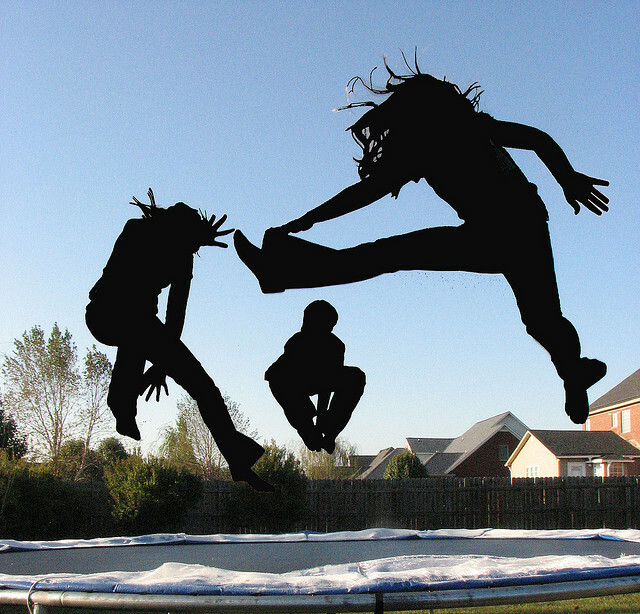 The increase in popularity of trampolines by youths has increased the variety of trampoline makes and models available on the market. When choosing the perfect trampoline for your back garden there are many important decisions to consider including, price, size and brand and safety. Mini joggers and rebounder trampolines are perfect for those with little space in the back garden and for keeping fit. For children the 5ft play trampoline by Plum provides fun on a small footprint and for adults 36inch and 40inch jogger/rebounder trampolines by V-fit and Studio Pro can be used for exercise in the ease of your home. Many exercise DVDs now include mini trampoline routines. The original rectangle recreational trampoline was the shape favoured by earlier trampoline models. Although still available they are not as popular on the market as modern circular trampoline designs. Rectangular designs are commonly used by gymnasts and professionals in a competitive environment. This is because rectangular trampoline designs are considered less safe when used by children and unprofessional jumpers. Rectangular trampolines should be supervised at all times. That is why the circular trampoline is favoured by most families. Circular trampolines come in a range of sizes to accommodate the size of your back garden. Circular trampolines are available in 5ft, 6ft, 8ft, 10ft, 12ft and 14ft models. So you can find the right fit for the space in your garden. For added safety all circular trampolines can be fitted with safety net enclosures, which encloses the whole jumping area for added piece of mind. Should your child jump too high they will be rebounded by the safety net, rather than falling onto the floor and injuring themselves. Safety nets are available in internal and external styles for circular trampoline sizes from 5ft to 15ft.